2 by 3 Heroes: While you weren't here. ... a few packages arrived at my house from some very generous bloggers. While the amount of cards received from the first two envelopes (12 total) I will spotlight are small, there is plenty to love. My bud Pat from Hot Corner Cards dropped another PWE on me. He finds all the custom collection cards I seem to miss out on via virtual dime boxing or repacks. You would think I'd have those junk wax Donruss in the bunting binder by now, but somehow I never pulled any. If fact, I have a feeling junk wax will start drying up and the prices will sky rocket. Yeah - and Lebron will sign as a free agent with the Cavaliers and return back to the city that ....what? Really? Anyhow - that Michaels is a nice card too. That Fleer release is pretty straight forward in it's design. 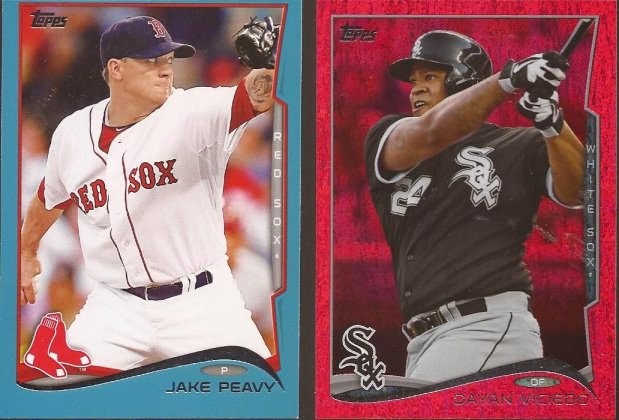 Dig that miscut Peavy. Sure, it doesn't fit my rules for miscut, but I will make exceptions, especially for recent releases. With the technology, these should be getting caught at the factory. One would think. That blood red sparkle does not work with the Sox uniforms at all. U-G-L-Y. But thanks for the cards, Pat. I also got Hoyled again, but a small Hoyle-ing. 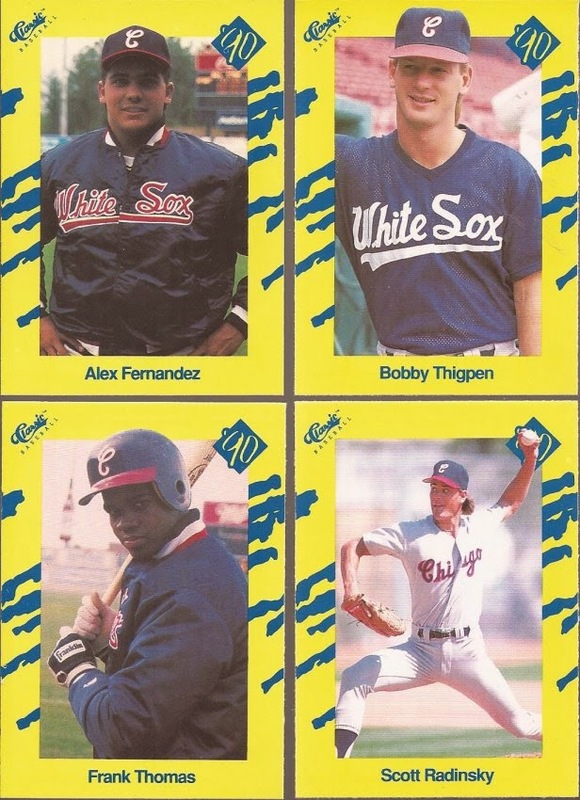 Mark sent along these four Classic ChiSox. Ye-owwwwwwwww! That color. Dig the Big Hurt looking all gangster. 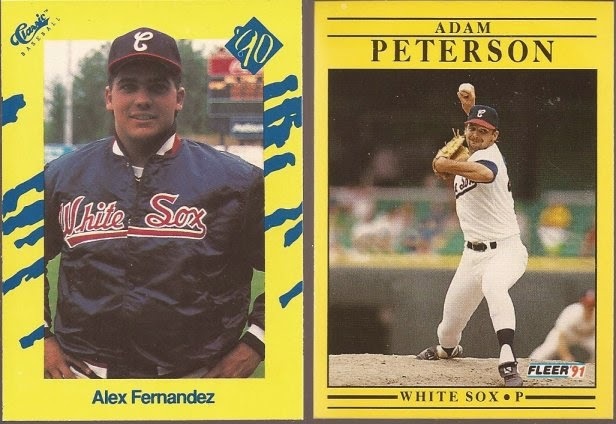 How do these Classic compare to the yellow of' '91 Fleer? Thanks Mark - be on the lookout for some BoSox. More deliveries to post tomorrow. Frank is a big dude, but somehow that batting helmet makes him look like Juan Pierre. I love those yellow Classic cards! Oh, The Cards You'll Get!